Every year we take a trip or two out of the studio to meet our guests and this time we went to the home of Scott & Glennis in Puyallup, WA. As we started the interview I pitched to them, “What attracted you, Scott to Glennis and vice-versa?” “We initially met in the health club in 1983. I was a fitness instructor there and Scott was selling vitamins and protein powders, working behind the juice bar. He was very handsome, very fit and very tanned. I was very attracted to him,” his wife, Glennis, said. 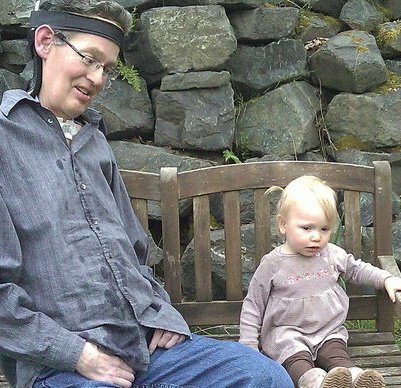 Now it was Scott’s turn to respond but because of this disease and “the volume of breath that he’s speaking with”, talking has been very difficult. When he talks, he rocks forward with each breath trying to get the words out and also writes “with his foot” for clarification. To answer this question Scott said, “[You are] beautiful.” Like a very active family, the couple enjoyed “running and lifting weights [and even] Scott helped coach [her] on a fast pitch softball team with [their] church.” Glennis began laughing and we all joined when she added, “I guess it wasn’t fast pitch, it was slow pitch!” I could see Scott smiling, too. 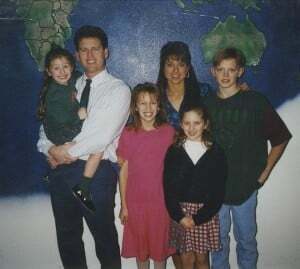 At this point in their lives, they were in “full swing of raising their kids, [being] self employed, very active members of [their] church, active with kids in sports, etc.” So, everything was going well according to plans until 1997 during Christmas time when they noticed that “Scott was having trouble pressing with a pen or pencil when he would write an invoice for a repair in [their] business.” The prognosis wasn’t what they were expecting to hear but other visits to neurologists also confirmed he had Amyotrophic Lateral Sclerosis (ALS) or Lou Gehrig’s disease. These two make a great team. Glennis would read whatever Scott wrote with his foot or what he said softly. According to Glennis, there are good days and bad days just like every other family but it’s very comforting for us to see the attitude that the Brodie family demonstrates in living with this disease. 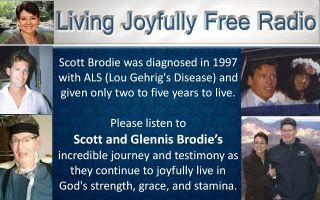 And seeing Scott’s can-do attitude firsthand, I was prompted to ask him, “How would you encourage someone diagnosed with ALS to not be discouraged?” He said, “Just to be in the Word of God, to draw near to God in His Word and to believe God over what you hear.” Scott has outlived the 2-5 year window that was given to him and just passed the 14 year mark this month. We talked about what kept their marriage intact for all these years, daily routines, impact of this disease on his spiritual journey, etc. As we were rounding up the interview, we decided to follow Scott into his office. Glennis helped him up and slowly we all walked forward. As we were about to enter his office, we didn’t have to look too far to see a sign above his door that read, “Dad’s Office, OPEN FOR ADVICE” and inside a white circle by it was “24/7”. I am not done yet, fans! He sat down, and wanted to let us know that he is a big fan of our show, too. He used his foot to work the magic to navigate to our fan page on Facebook. I was astonished! In saying good bye to him, I sat down on the floor, lifted my right foot up to his right foot, did a high five and we parted. It’s our prayer and hope that his healing will come soon! Feel like you can’t get a break in life? Tired of life’s constant struggles? Does it seem like circumstances are too tough – too insurmountable? Scott Brodie has a word of encouragement for you today. This post is part of a series on assisted suicide – but don’t let that keep you from perusing. No matter the topic, these videotaped excerpts from the Brodie home will bless and encourage you. They encouraged me greatly! From behind the camera comes a soothing, upbeat voice. If you were listening to the audio alone, you might think she doesn’t have a care in the world. One glimpse through the lens, however, reveals an entirely different picture. Sitting in a chair, her husband Scott cannot move his arms or hands. Underneath his shirt is a back brace that holds his head up. It extends from his lower back to the crown of his head. Although he can’t turn his head in the brace, thankfully it allows him to sit upright, walk and move around. 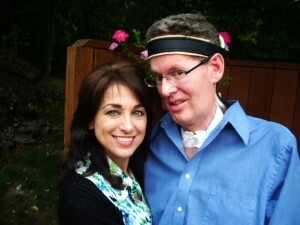 The tracheostomy Scott had last year reduced his ability to speak even more. At night, when Scott is on the ventilator, he cannot speak at all because the cuff is inflated. Glennis interprets as he spells letters with his foot. She’s very adept at interpreting. Sometimes Scott only has to sign a few letters and Glennis figures out the whole word…maybe even the entire phrase. Of course, it helps to have been married for twenty-five years. I suppose after all that time you could almost read your spouse’s mind. A couple of weeks ago, I saw a brief segment of Larry King’s interview with Jack Kevorkian. I was appalled. Absolutely sickened. God immediately gave me the idea of calling Scott Brodie to ask him to watch the next airing of the Kevorkian interview and share his thoughts with us. I had forgotten, until I watched the next airing myself, that Thomas Youk – the man for whose murder Kevorkian was sentenced to prison – had ALS, like Scott Brodie. (Perhaps I was too sick when the conviction occurred to remember this key fact.) In typical fashion, God was working in the details. He knew Scott’s input on this topic would be invaluable. Scott types with his toes and has an incredible blog. He maneuvers the mouse with his feet and accomplishes a great deal on the computer and the internet. I look forward to a true ‘guest post’ from Scott in the future – one without my words – but this week, in order to post a prompt response to a vital issue, this guest post became a collaborative effort between Scott, Glennis and me. Below is video of Scott’s post – as well as a dialogue transcript that includes Glennis’ interpretations and elaborations. I’m glad she weighed in! Assisted suicide has become an appealing idea to caretakers as well. A documentary about Kevorkian, the assisted-suicide advocate, began airing this week on HBO. A companion piece to the HBO movie “You Don’t Know Jack,” starring Al Pacino and Susan Sarandon, the documentary sparked a pro-killing media blitz across the nation. One would hardly recognize it as such, though, for killing is beautified – packaged as mercy at its best. The movie, documentary, interviews and press coverage have produced an innocent, enticing image of murder and suicide. Who stands to be influenced? Strictly patients with a terminal illness? No. When the sanctity of life erodes, all life is cheapened. One sector of society gains authority to determine whether others’ lives are valuable enough to exist. Ultimately, it affects everyone – even you and me. To busy people who don’t want to care for aging parents. To insurance and state healthcare agencies who prefer to fund assisted suicide rather than costly life-extending treatment. To someone who has a progressive disease, or is depressed, or is struggling financially or in chronic pain. Once we slide further down this slope, the impact upon our lives and freedoms will be devastating. If ever there was a time we needed to hear from Scott Brodie, it is now. As I watched the second airing of Larry King’s interview with Kevorkian, six questions came to mind. I emailed them to Scott right away, expecting a typed response. The video response He and Glennis chose, however, is much more illuminating. What has been the progression of your illness? 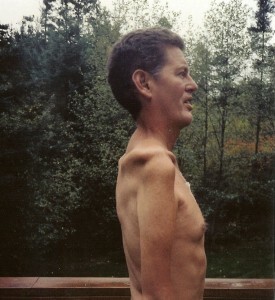 “Scott had to have a feeding tube placed in 2005, five years ago. He is on a liquid diet of canned things or things we can puree and concoct. “This back brace was about that same year – 2005. It may have been completed in 2006. But Scott walks with this back brace, which goes all the way down to his mid-back. It’s underneath his shirt. It keeps his head supported. That way he is able to maintain his balance. It gets a little hot. He can’t really turn his head side to side, but he can move. “April 1, 2009 he had tracheostomy surgery. That was a huge, prayerful step in the months and year prior actually. But now a year has passed and he is doing really well. He has had to fight a reoccurring lung infection. So that has been the biggest challenge, but we seem to have a God-given way to manage that right now. We praise God for that. “Scott has no use of hands, which limits him from many things – there are many things he cannot do. No driving, of course. He’s at his computer most of the day, but he types with his toes and operates the mouse with his foot. Most everything has to be done with his foot. “Sometimes he will spell the letters out if he is on his ventilator (which is over there on that side of the room; It’s a laptop vent). At night and in the morning when he’s over there, he’s not speaking because the cuff is inflated. He can’t speak when that’s up. So he will spell letters with his feet and then I get to interpret…and that’s a lot of fun for me,” she says laughing. “It was hurdle for Scott to use the wheelchair, even though he wasn’t dependent on it. This was before the feeding tube, when He had lost so much weight. He was 120 pounds at six feet tall. He didn’t have energy or endurance to walk far. So that was a big, big hurdle. Scott: “Even for me,” Scott adds. Glennis: “When Scott sees himself recorded, he doesn’t know what the guy is talking about,” Glennis laughs. “So yes, there have been a lot of things we’ve had to bring before God and get his grace to know how to continue on, right? Have the losses caused you to feel that your life has lost meaning? Glennis: “–loved you and gave you the hope to continue on. Scott: “God does not see as man sees. God sees the heart. Do you feel that your life has meaning? Please explain. Glennis: “You don’t feel that you suffer? Well, most people would call it suffering because you have limitations and you haven’t been able to get – you’re not what’s considered normal, I guess. “Scott’s life has tried all of us actually, because we have gone through different seasons of having to trust God ourselves – for our security, for our capacity, for the fear that might want to grip us at times, especially at times when things have gotten very scary with his health. We don’t know one day to the next what will happen, but we’ve watched God’s faithfulness. We’ve learned and watched how God has cared and provided and it’s helped us to draw close in our walk with God – to know how much he loves each one of his creation. He’s made them unique and wonderful. Scott is able to minister through his life. As testament, he is able to shine the love of God through himself to others, and he does that with our family. He does that with our friends and also to people that we just meet. 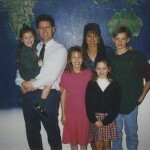 In the 2006 interview, Scott shared about a time that he was tired of fighting and wanted to go to Heaven. God answered him – and in that answer God shows us what value our lives have, no matter our abilities. If the possibility of Divine healing on earth were taken out of the equation, would you consider assisted suicide? Why not? Would you have considered it in the past? Why not? Scott: “No – because only God knows the time and I do not want to take that away from Him. Glennis: “Last year, Scott did consider the reality that he might [be on his way to heaven]—there was a different time last year before and after his trachestomy surgery, when he thought ‘maybe I’m not going to get my healing’ and thinking ‘I’m going to be going to heaven soon.’ And he was okay with that. There was no fear. He thought, ‘I’ll be with Jesus. No problem. 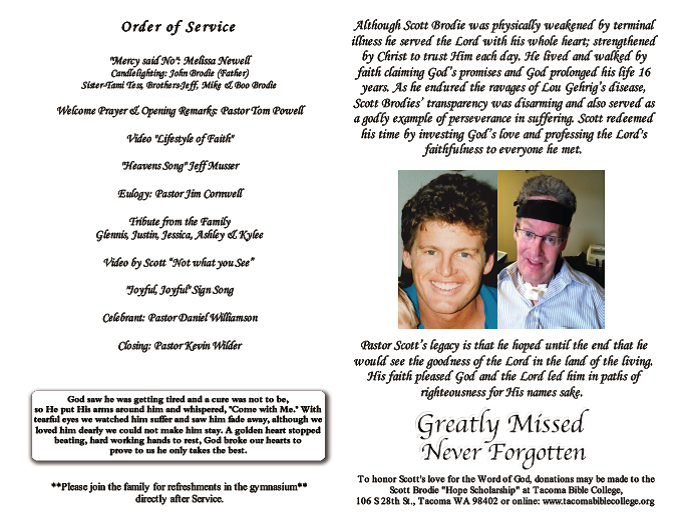 I don’t have to hold onto this.’ Scott really has over and over again laid his life at Jesus’ feet. I think in the early years he really clung to God’s promise of healing and it has kept him very fervent for healing and to be back to the way he was. But now he wants to glorify God however God sees fit. Glennis: Yes, because doubt comes in and you think, ‘Did we actually [hear correctly]?—God surely you didn’t mean this.’ So I guess we do examine, ‘Okay, this is a new place God. I didn’t bargain for this. I only thought so far into my future, but not this far.’ So we have to keep going back for His grace, for Him to enlarge us for the next step. If you had a friend who came to you and said, I have just been diagnosed with ALS; I want to end my life. What would you say? Glennis: “Let God love you right where you’re at. Yes, that’s good. I know that for years, all we could do was believe against hope. Abraham did that. He believed in hope. Against hope, he believed in hope. That was such a stable verse for us. We said, even if we can’t muster the faith to believe much, we can hope that God is good and that He does love us and He has our best interest and His glory in view as these things are transpiring in our lives. We have to draw near to Him to know what to do. So we’ve looked for His guidance. 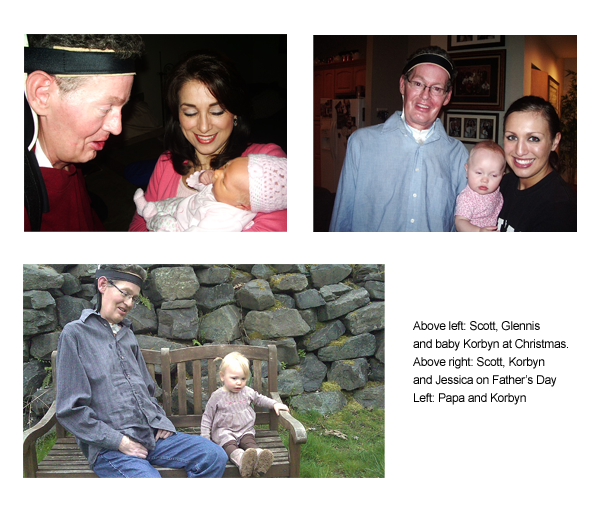 We’ve looked for His wisdom in the therapies that Scott has done, in the steps that we’ve made in our business. “We have seen much in the last 13 years! Our wedding anniversary of 25 years was last September. Boy, we wouldn’t have thought that Scott would have seen that day. “Then Jessica became pregnant and we were like, ‘Oh, do we have those nine months? Will Scott see our first grand baby?’ And he did! “Now [our granddaughter] is a year and a half and she comes and helps her Papa. She likes to help just like my kids like to help and they do what they can. She’s very cute. She comes and brings him a tissue and helps with the little things she can do. It’s so sweet. “We’ve seen our son be raised up and take over the leadership of our business and we’ve seen expansion of our business into another state, into Arizona. Natalie: “A picture is worth a thousand words,” the saying goes. To me, one action of Scott’s speaks as loudly as his profound words. 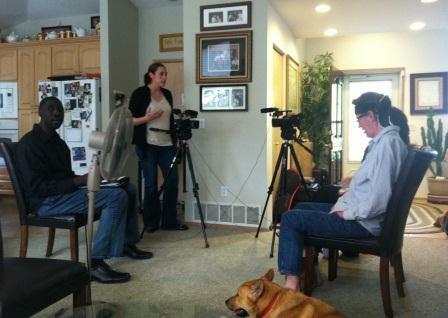 When I see Scott and his family on home video engaging in this simple activity, volumes of truth are conveyed. 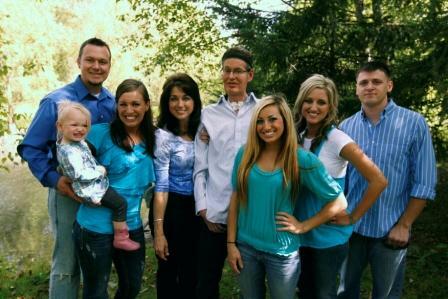 Much is revealed about how Scott and Glennis have responded to catastrophic circumstances – and in turn, how their children have responded as well. What is this activity? Dancing. Yes, that’s right! In the face of hopeless circumstances, the Brodies dance. When others would be angry at God, they praise Him. When others could only focus on what has been taken from their lives, the Brodie’s focus on what they’ve been given. When negativity would encroach on another, the Brodies celebrate the simple joys in life. When many would paste a permanent grimace on their face, laughter constantly fills the Brodie home. This last video clip briefly shows Scott’s decline from being able to speak normally and hold his head up to experiencing difficulties with both…yet he literally dances through through the storm. This is a must see! It will change your day!! …no matter what you are facing! He went from being a happy, healthy athletic husband and father of four to a man given a death sentence in a doctor’s office. His world turned upside down in a matter of moments. 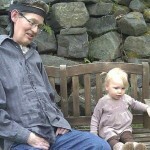 Would Lou Gehrig’s disease defeat him or did God have something else in mind? Although we are awaiting the final edit of this moving interview with Scott Brodie and his wife Glennis, I can no longer wait to share this amazing story with you! 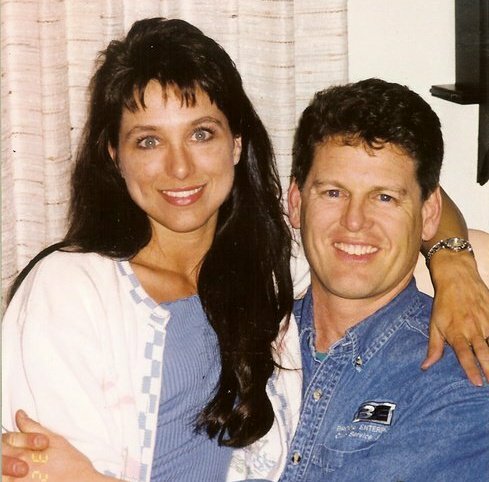 No matter what trial you are facing today – frustration with your job, trouble in your marriage, financial challenges, job loss, illness, children addicted to drugs – Scott and Glennis’ story will give you hope! 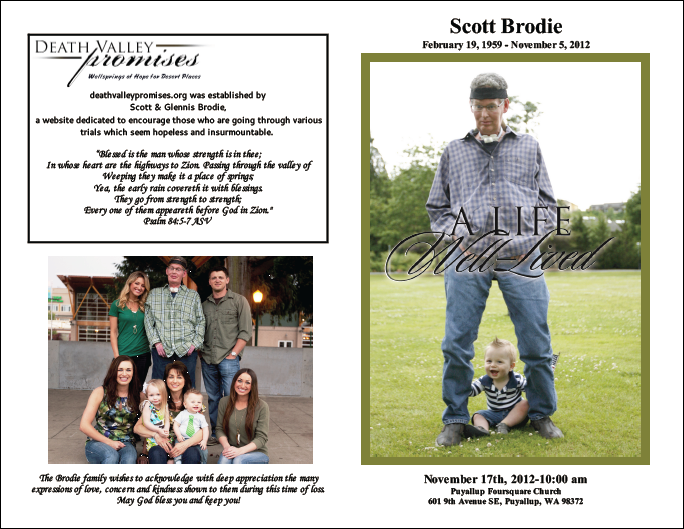 “I told God I would rather die and go home to heaven – I was tired of fighting.” Scott Brodie was weary and depressed. Years earlier as a young man, Scott was an accomplished athlete. 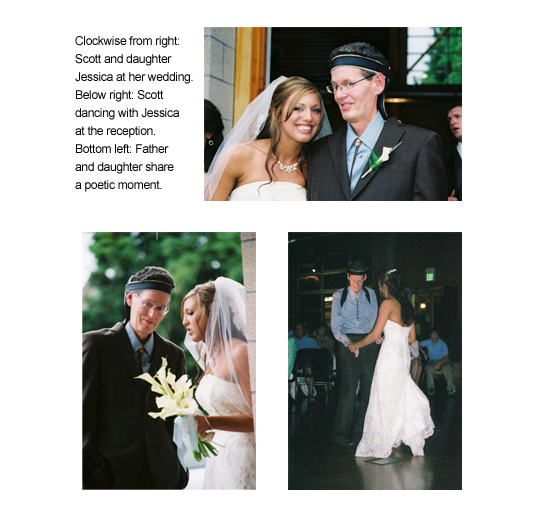 Diagnosed with ALS (Lou Gehrig’s disease), Scott was given just two to five years to live. For over 13 years Scott has maintained his faith and joy in Christ while walking through the valley of the shadow of death. Be inspired to find hope, contentment and promise in Christ – no matter what you are facing! Charlie Wedemeyer, one of Hawaii’s most storied high school athletes who earned his greatest accolades for his dogged fight against Lou Gehrig’s Disease, died this morning in California. He was 64. Wedemeyer had undergone two major surgeries in recent weeks. In 1960, Wedemeyer was voted the Prep Athlete of the Decade. Last year, he was named one of the Hawai’i’s top 50 sportspersons in the 50 years of statehood. Wedemeyer, a multi-sport athlete at Punahou School, was diagnosed 33 years ago with amyotrophic lateral sclerosis, the degenerative nerve condition that killed baseball’s “Ironman” at age 37 on June 2, 1941. ALS is usually fatal within three years of diagnosis and only 10 percent of those afflicted live beyond eight years. 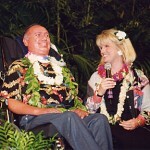 Despite Charlie’s illness, the Wedemeyers would make speaking engagements, with Lucy delivering his message by reading his lips and his eye movements. In 2005, the Wedemeyers made speaking engagements at Central Union Church and the Hawai’i High School Athletic Association Hall of Honor dinner. In recent years, Charlie’s kidney failed and last March, he was hospitalized and underwent three surgeries. 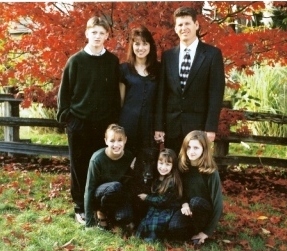 Through it all, the family remained incredibly upbeat. “God is so good. We have been blessed,” Lucy said last year. Charlie and Lucy Dangler were high school sweethearts at Punahou, where Charlie played quarterback and halfback and was a three-time all-star in the Interscholastic League of Honolulu. In 1964, he was named ILH Player of the Year, and played in a playoff game against Kamehameha that was televised throughout the state. At Michigan State, Charlie was a receiver for the No. 2-ranked 1966 team that played No. 1 Notre Dame to a 10-10 tie in college football’s famed “Game of the Century.” It also was the first game televised live to Hawai’i. After getting married and graduating, the Wedemeyers settled in Los Gatos, a small town about 15 miles southeast of San Jose. They had two children, Carri and Kale, and Charlie began a successful career as a math teacher and football coach at Los Gatos High. Then in 1976, he started dropping the chalk when writing math problems on the chalkboard in class. After similar difficulties with his hands, he went to see a doctor, and eventually he was diagnosed with ALS. Lou Gehrig’s Disease is an incurable neurodegenerative disorder that attacks nerve cells and pathways in the brain and spinal cord. The result is a loss of muscle control and movement. ALS, which affects one out of every 50,000 people, accelerates quickly and many patients totally succumb within two or three years of diagnosis. In Charlie’s case, he was given one year to live. But the Wedemeyers did not focus on what was taken away. 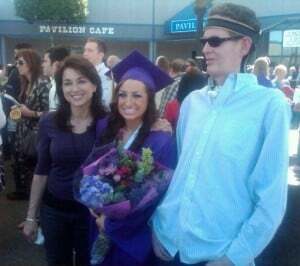 In the early years of his illness, Wedemeyer prayed that he could get to see his two children grow up to graduate from high school and then college. They did. Carri runs the website for the Charlie Wedemeyer Family Outreach program, which raises money for ALS research, while Kale is a doctor in private practice. 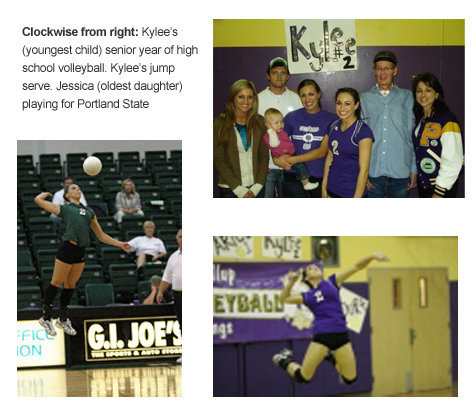 One of the most versatile athletes locally, Wedemeyer, who was 5 feet 7 and weighed 164 pounds, earned nine varsity letters in high school. He was a first-team all-star with teammate Norm Chow when Punahou won the ILH basketball title in 1964, and played second base on the school’s 1965 ILH championship baseball team. Wedemeyer played in the East-West Shrine Game at Candlestick Park in San Francisco, and then came back home to play in the 1969 Hula Bowl. He played two years of semi-pro football for the Lansing (Mich.) All-Stars. Charlie’s greatest accomplishment, though, came as football coach at Los Gatos High School, winning seven league championships and posting a 78-18-1 record — after he was afflicted with ALS. In 1985, his team won the Central Coast Section Championship with Lucy, on the sidelines again, reading his lips and relaying his plays to assistant coaches. “I think it’s important to remember that we will all be confronted with adversity that may seem insurmountable,” Charlie said in 2005. “When it does happen, we have to remember that God has given us the freedom of choice: We can choose to feel sorry for ourselves, be bitter and angry, and cause everybody to be miserable. Or we can become a stronger and better person for it. “Pain and suffering are inevitable — we all experience it. But misery is an option.